What does a Jesuit priest and the current mayor of Alburquerque have in common? They both figured out that doing an honest day’s work gives a person self respect and empowers him or her to believe in themselves. The republican mayor wanted to do something about the increasing number of homeless people on the streets, begging in Albuquerque. So he did something surprising: he stopped to talk to them. Mayor Richard Berry asked them how the city could help. And the answer was — they wanted jobs. So the mayor started: There’s A Better Way program, which hires homeless for the day to work to beautify the city, gives them lunch and offers them a place to sleep for the night. The program has been successfully running for over a year. Father Greg Boyle wanted to help stop gang violence in Los Angeles. As the pastor of the Dolores Mission Church in East L.A., he not only heard the stories of his parishioners, he lived them. He went to the worst gang-torn neighborhoods of Los Angels and started his ministry, which became Homeboy Industries. Their slogan: jobs stop bullets. He started the industry by buying an old bakery in the hopes of starting a business that would employ gang members and keep them off the streets. Now Homeboy Industry employs tens of thousands of former gang members. It has become one of the largest, most comprehensive and most successful gang intervention, rehabilitation and re-entry programs in the country. 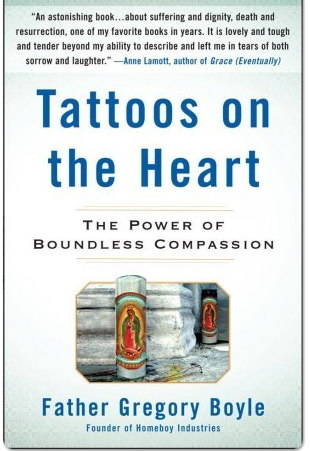 I recently read Father Boyle’s amazing book Tatoos On The Heart. The stories of the former gang members captured my heart. The success of these two men’s endeavors is inspiring. Both men showed people who had been marginalized that their lives had value and were valued. Both the Priest and the Mayor believed in people who were down on their luck or trapped in untenable situations. They are helping people find their self worth, which helps people turn their lives around. The taxpayers in Albuquerque, along with a nonprofit organization, are helping keep the successful A Better Way program running. Check out Father Boyle’s Homeboy Industry website if you want to help too. Great book! The Just Faith program used that as part of its curriculum about social justice.